It is that time of the month again for monthly favourites (ahhhh!). I love doing my monthly favourites and I love sharing it with you guys! This month I have a few recent purchases, and then some oldies which I am still loving and using every month. In this month's favourites, I am also going to be including a favourite song as I am really enjoying some of the new albums which are currently out and having songs on repeat are always a must - I bet you're thinking of a song right now that you always wack on repeat. Let me know what it is! My skin care favourite throughout this month has been the No7 Beautiful Skin Night Cream for normal to dry skin. I absolutely love the feeling this moisturiser has on my skin. I also love the consistency of this product. It's a cream, yet it feels like a gel and it's as cold as a gel. This cream is a life saver for me, and leaves my skin feeling absolutely incredible in the evening after a long day. A pro of the No 7 products are how long they last. I have had this pot of cream for so long and it is still pretty much full; you really don't need a lot and a little goes a long way. If you have never tried No 7 skin care products, then I highly recommend them; they have such a selection and you will not be disappointed. One of my makeup favourites of this month has been a +Makeup Revolution blusher. This baked blusher is in the shade "Make Love Instead". It is a beautiful coral pink blush with only a slight bit of a shimmer; it's hardly noticeable. A little goes a long way with this blush as it is so pigmented but so beautiful, especially on pale skin tones. I found this blush absolutely incredible when I came back from holiday but I love it just as much now my tan is fading. This was only a couple of pounds and I have never loved a blusher so much until now. Also, if you put way too much on to begin with, it is so easy to blend; you won't have an issue. What is a favourites post without mentioning nail varnish. I have been loving the +Accessorize nail varnishes. I purchased these when they were on sale and I have a blog post all about these which you can find in my archive of June. The quality of these nail varnishes are incredible. They last such a long time, and you only need one coat of each nail varnish. They have a brilliant range of colours and the most beautiful shades you'll find. I cannot find a fault in these nail varnishes and for sure, I will be purchasing more if they bring out different colours as I now have them all. My second makeup favourite of this month has been another +Makeup Revolution product, but this time an eyeshadow palette. This is the "Make up Geek" eyeshadow palette with the most beautiful colours. I decided I wanted to adventure out and try brighter shades on my eyes and this palette was perfect for that. I created a pink look on my "Makeup Revolution First Impressions" post where I used this palette with other products from +Makeup Revolution. This palette had very little fall out, the colours are very pigmented for the price and to be honest; they really did last all day on my eyes. Every eyeshadow palette I own is by +Makeup Revolution and they have never let me down. I have always been a lover of books. Through the whole of my life I have had a book case full of books and then a pile next too it where I don't have enough room. You would have always found me with a book in my hand but as I have got older, I found that I never have the time to just sit there in the corner of my room and read. When I went abroad to Cyprus I took the book "One with You - Sylvia Day" with me and I couldn't put it down. Once I finished it, I instantly regretted not taking another book with me and books were quite pricey when I was in Cyprus. Now I'm back in England, I am taking advantage of charity shops and book stores, and I have done the largest book haul you'll ever see. One series of books I have really been enjoying and reading everyday is the Pretty Little Liars series by Sara Shepard. I watch Pretty Little Liars on Netflix every single week and I know exactly what's going on but I love reading the books, after I've seen the programme or film. These books are well written and such a good read. I won't stop reading these books until I have finished them, and then I move onto the next. If you want a good read to get you through summer then try out this series and I'm sure you won't be disappointed. Last but not least, I have a favourite song of the month. I create a post every month which is a playlist I plan to listen to. Whether I listen to this playlist every day or every month; it gives me the opportunity to find new songs or go back to oldies which are just brilliant. One song I have fallen in love with is "I Hate U, I Love U - Gnash ft Olivia O'Brien". This is such a beautiful song and I forever have it on repeat in my car, even though I have thousands of songs. It's a new song out and has been brought out in the NOW 94 album. Youtube this song and check it out. I love it! 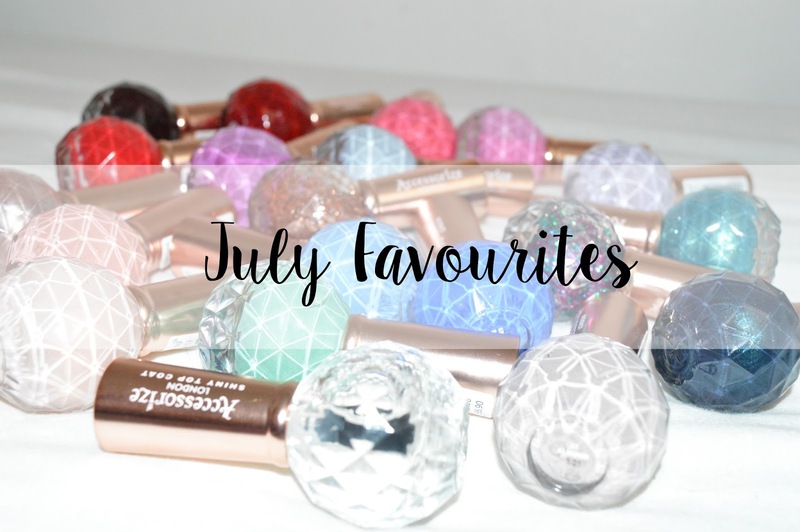 Let me know what your favourites have been throughout the month of July! Love seeing the odd favourites post to see what people are loving. I love the look of that Make Up revolution blush. They always seem to have amazing products. I love them!